Is the softest of beds in the world it is said. He makes it from pompoms he grows on his head. The softest of fluff—and unlike the Jedd, there’s just a bit more to it than piling up the pompoms to sleep on. In honour of all the knitters who’ve recently subscribed to Yarns, I thought I might tell you the little bit I know about how to go from pompoms to knitting wool. One thing I can tell you is that the “process” of turning a living fibre into yarn is as much art and experience as it is predictable process. Like the Jedd’s pompoms, wool is exactly that—a living fibre whose character is determined by genetics, environment and the nutritional history of the animals who grow it. So each clip will be a bit different, and the yarn that is made from it will be as well. CSIRO, bless their cotton socks, some years ago perfected the quantitative measurement of wool fibres, to a level of precision that probably exceeds what is useful in the real world, especially given the variation in fleece variables on a single sheep, let alone through the flock. However, these are the measurements the industry has come to rely on, so I’ll give you an overview. 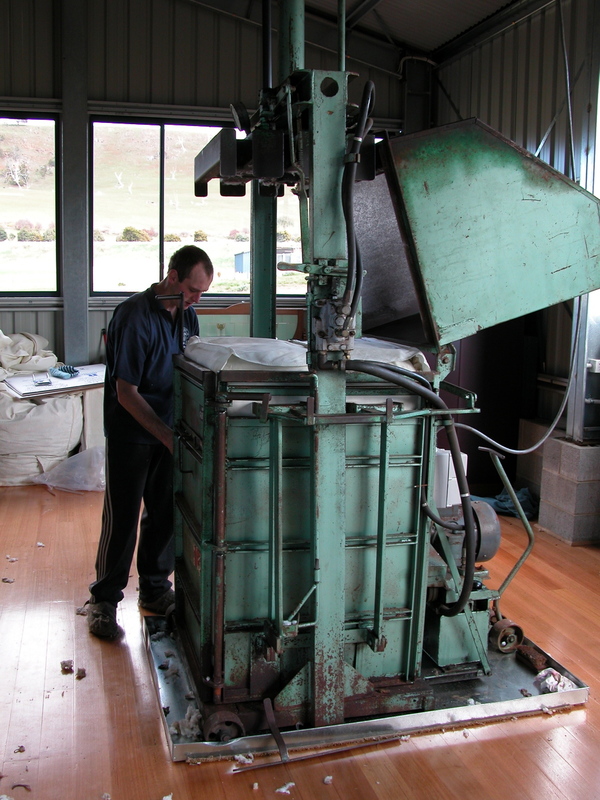 The fibre “staples” or samples are drawn from cores taken out of the bales in a given line of wool. Staple diameter, length and tensile strength are measured, along with yield (how much is actually wool rather than lanolin and dust) and the amount of vegetable matter (VM), principally grass seeds in Tas, burrs on the mainland. 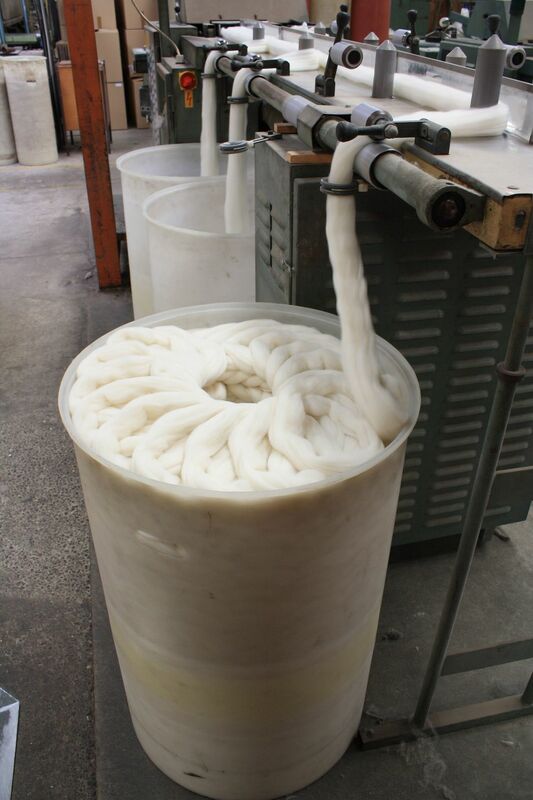 Diameter is probably the most important variable in determining the softness of fluff, while length and tensile strength are important in the combing and spinning processes as well as in the final yarn. Tensile strength is particularly sensitive to nutrition—any abrupt change in nutrition will cause a “break” in the fibre and, in the process of combing, is likely to result in two short fibre halves, rather than one nice long staple. It also makes the spinner very cranky. Justifiably. Having shorn the fluff off the sheep, classed it as to characteristics and pressed it into bales (unlike the Jedd, who simply lives on the very large pile of pompoms, we need to get it down to a reasonable volume to ship, so use a large hydraulic press to do the job), the next step is to get it scoured. Before we head to NZ to get it scoured, though, a couple of comments. Why NZ, and not Australia? For about 2 years, I tried everything I could to find a commercial spinner who would spin my 17 micron fibre in Australia, and finally had to admit it just wasn’t going to happen. Neither of the two major spinners left standing in Australia were willing to tackle a fibre that fine. My NZ spinner, Design Spun, has been truly wonderful, working with me to correct some issues in the first batch that was scoured in Australia, and then helping me create the chunky boucle. I have so enjoyed working with Peter Chatterton and his crew. 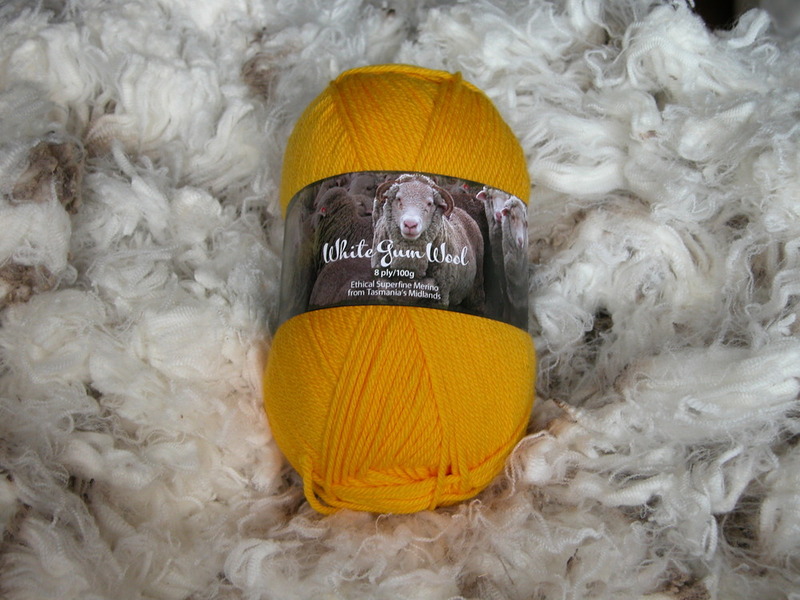 And the second comment: a bit about what parts of the fleece to use. I use only the skirted fleece wool. An Italian producer that I visited a few years ago showed me that they use a mix of fleece, skirtings, even bellies, when they mix wool for scouring. That’s where some of the art comes in. They know what they can get away with, and how it will turn out in the spin. Since I really don’t know how to judge that, I decided to use only the top of the line—the pure fleece wool. Skirtings are the bits around the edges, that generally are shorter, have more VM and dirt. Bellies are just that—short, dense, lots of VM, dirt and stain. Scouring is tricky. First off, I want to know that it is only my wool that is going into the yarn, so I need a scourer who will work relatively small batches (my clip generates about 2 tonnes of greasy fleece wool, which will turn into about 1300 kg of yarn each year—so definitely a limited production). 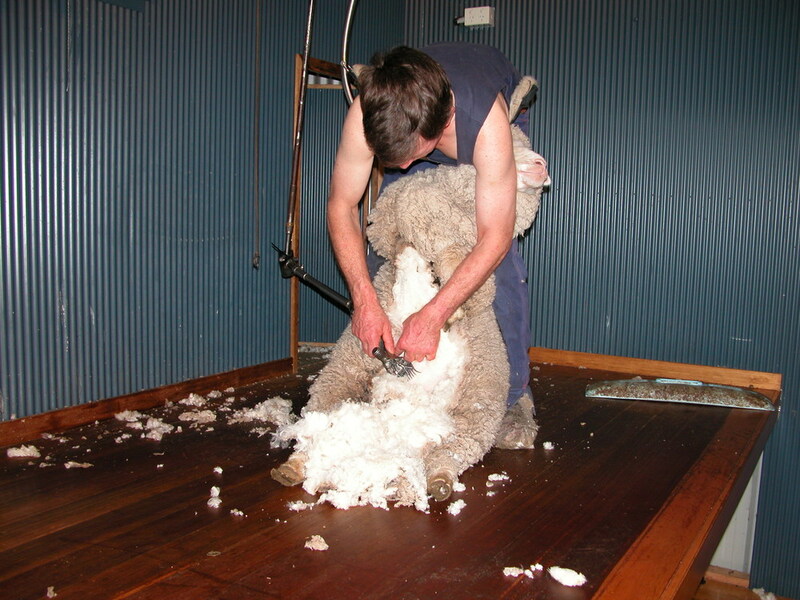 Second, scouring a fibre that is less than half the diameter of fine human hair means you have to be gentle, but still get essentially all of the lanolin out, or it will gum up the combing machine. Which makes the spinner cranky. Justifiably. Canterbury Wool Scourers have done a brilliant job for me. They send the scoured wool on to Design Spun, who do all the rest: combing, dyeing, spinning and packaging. DS do what is called “worsted” spinning, as opposed to “woollen” spinning. The latter is what you would use for tweed—a fairly basic carding, which leaves many fibres crosswise and sticking out. Hence the hairyness, but also the air- and warmth-trapping capacity of tweed. 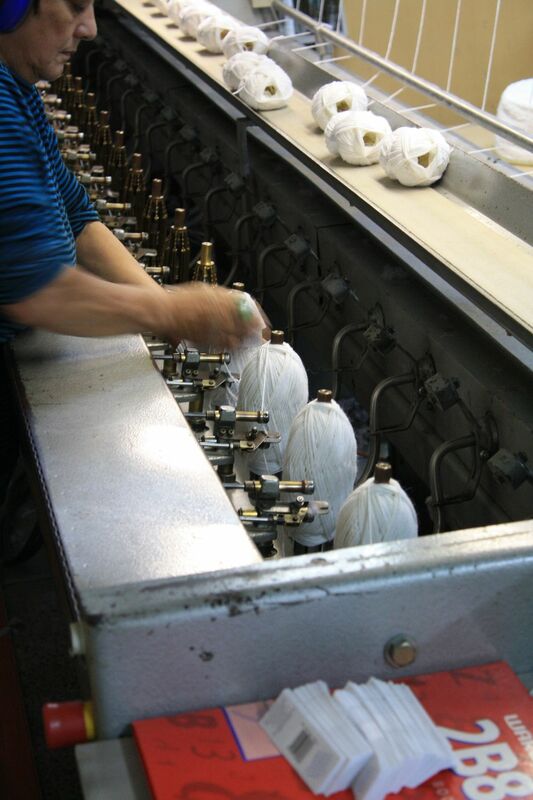 For worsted yarns, the fibres are combed, split, recombined and re-combed many times, to ensure the fibres are as aligned as possible along the direction of spin. That, together with consistent fibre length and high tensile strength, gives White Gum Wool yarn its characteristic “buttery” feel, good stitch definition, and ability to withstand wear, while still being soft enough for a Jedd to sleep on. Older PostWelcome to the new subscribers!